A picture book, written and illustrated by Holly Dunn. But Moth isn’t like the other moths. She doesn’t like the light or the crowds. But the New Zealand forest is dark and dangerous for a moth out on her own. Will she find a friend who doesn’t want to eat her? 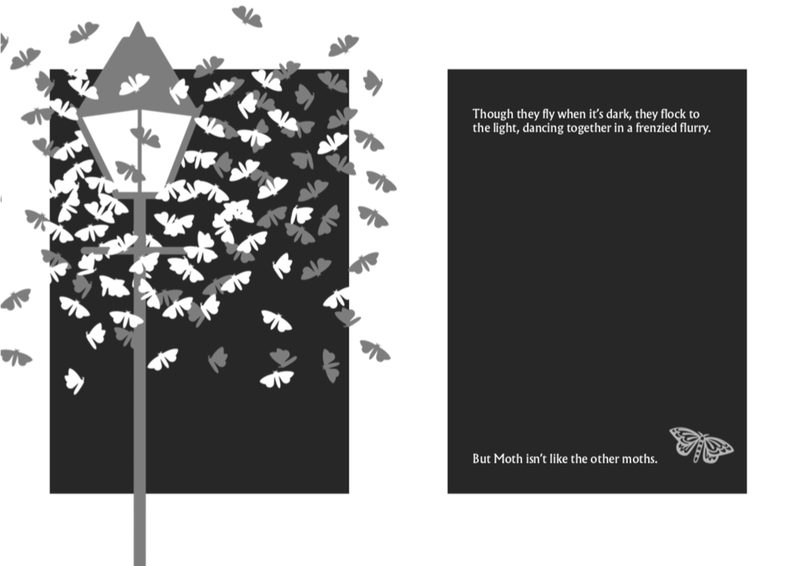 MOTH is a picture book about friendship and belonging, and how it feels when you don’t fit in. It aims to help children to better understand social anxiety and introversion in a safe and relatable way. Children and adults will enjoy spotting the different plants and animals native to New Zealand, including kowhai, weta, and kiwi. But Moth isn’t like the other moths. She doesn’t like the light or the crowds, and the New Zealand forest is dark and dangerous for a moth out on her own. Will she find a friend before the sun comes up? Moth is a picture book about friendship and belonging, and how it feels when you don’t quite fit in. Children and adults will enjoy spotting the different plants and animals native to New Zealand, including kowhai, weta and kiwi. Available on my website, and in New Zealand bookshops 27.09.18.